This is a collection of custom calls made by some of the best artisan in America. I have been honored to be one of the Call Makers included in this book. 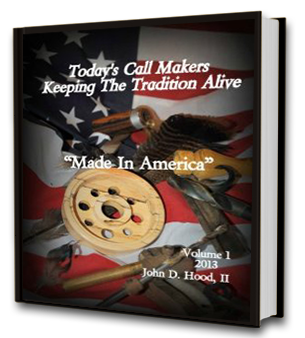 Inside this book you will find close to a hundred different Call Makers that are keeping the tradition of call making alive by producing works of Art one at a time, that are still functional in the field today. This book can be ordered for $36.99 plus $4.00 shipping. If you wish to have this book personalized in a certain way, please add that in the comment section of the pay pal invoice.